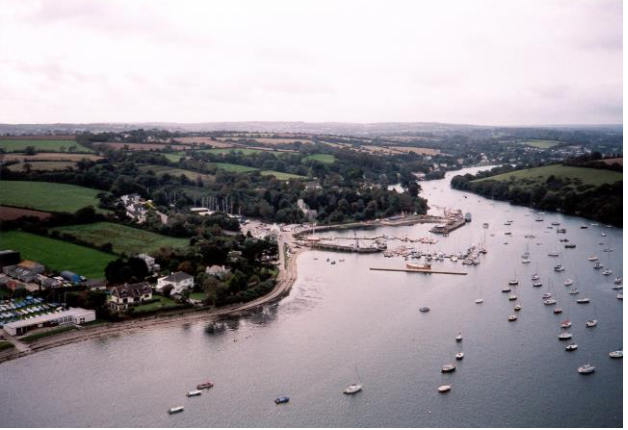 Mylor Harbour is situated on the Fal Estuary (Carrick Roads) in Cornwall. The sediments within the harbour were primarily contaminated with Tributyltin [TBT – an organometallic compound] and associated degradation products. TBT had been extensively used as a biocide in anti-fouling paints – these paints were used to provide protective coatings on the hulls of boats. As a consequence of ship maintenance and natural paint flaking TBT has been released / deposited into the harbour waters – the paint flakes had naturally settled to the base of the harbour and had become accumulated within the sedimental matter. The harbour sediments were investigated by Hyder Consulting [Hyder] and it was concluded that the sediments were significantly contaminated with TBT and degradation products (for example Dibutyltin). Envirotreat were initially commissioned with the aim of stabilising the contaminants prior to transport to landfill – earlier desk studies had indicated that the contaminated material could not deposited at sea due to the presence of contamination. It was subsequently concluded that the sediments would be classified as hazardous which determined that offsite disposal would be unacceptable due to the prohibitive costs and lack of suitable disposal sites – the nearest hazardous waste landfill being located at Swindon, 200 miles from Mylor. It was therefore decided to treat the sediments for potential reuse on-site. There were initially no plans to reuse the material. Following discussions with all parties it was agreed that the treated material should be utilised as infill material within the Admiralty Quay – the objective was to infill the void space and construct a sea wall enclosing the void space within the Quay thereby creating a suitable area to be developed as a much needed car park and dry storage space. Envirotreat developed a suitable stabilisation methodology incorporating EClay technology and cementitious materials to provide the necessary environmental and geotechnical properties to enable reuse of treated material within the available void space within Admiralty Quay. This treatment approach was implemented with full regulatory approval under the auspices of Envirotreat’s Mobile Plant Licence. The necessary approvals were obtained from the Environment Agency and English Nature. A Site-Specific Working Plan was developed to fully describe the proposed remediation site works, the necessary environmental controls and the validation process.